This has to be the most important thing you can do when you start working with Lightroom. The simple act off learning keyboard shortcuts drastically cuts down the amount of time that you spend on post-production. It also isn’t that difficult to learn the shortcuts. 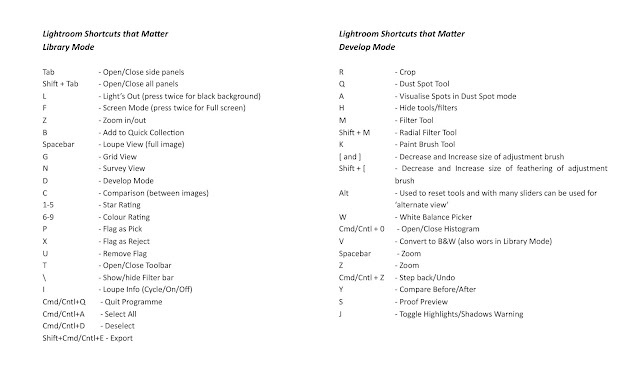 Simply choose one shortcut every time that you work in Lightroom. Before you know it you will have a string of commands that you don’t even need to think about using. 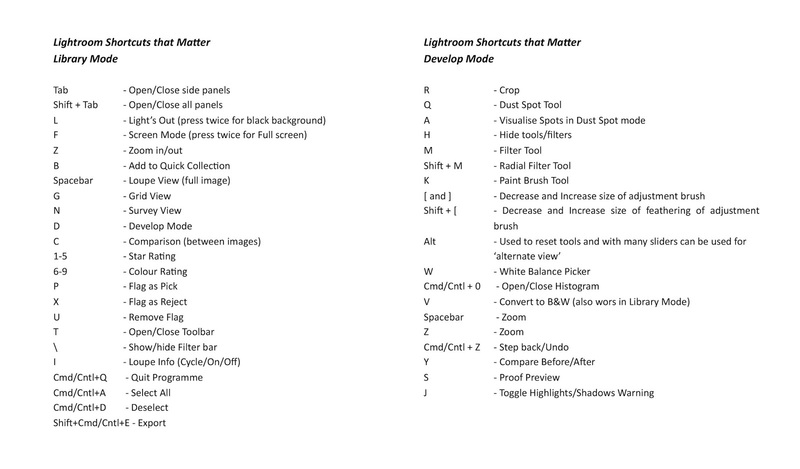 Lightroom documents all the shortcuts that are available. You can see these by going to the upper menu bar and hitting Help>… Module Shortcuts (where … indicates the module that you happen to be in). You can even use a keyboard shortcut to show the keyboard shortcuts: Cmd+/ for Mac and Cntrl+/ for Pc. Personally the ones that I have found the most useful are those in the image below (click and save the image for future use if you would like). The only downside to learning the shortcuts is that Adobe clearly have had a different set of programmers and designers involved with each different photo editing platform. Rather than keeping continuity across the different programs we have situations like this; To use the Healing brush (aka Spot tool) the shortcut key is Q in Lightroom, J in Photoshop and B in Adobe Camera Raw. Similarly the crop tool is C in Photoshop and ACR (this is logical), but R in Lightroom (what?!?). There’s at least continuity between ACR and Lightroom with the Brush tool having the shortcut key K, but then they have different keys for the filter tool; G for ACR and M for Lightroom. Seriously, Adobe needs to have a sit down with the different teams and get at least a semblance of continuity between them (and it only gets worse once you start really diving into the Creative Suite with the other apps like Illustrator, Dream Weaver and of course Premiere Pro). 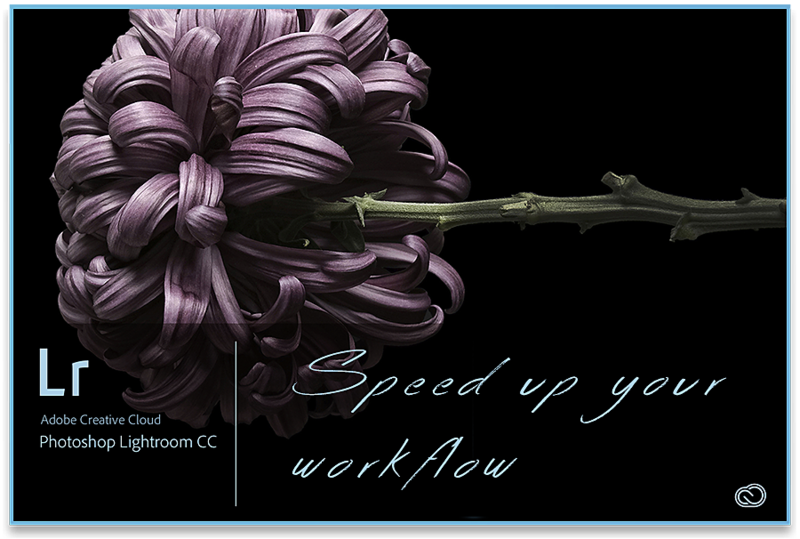 Lightroom has a lot of lifting to do with what is amazingly a rather compact and streamlined interface. One of the reasons that Lightroom is easier to learn than something like Photoshop is simply because it doesn’t have as many controls and adjustments displayed to the user. This doesn’t mean that they aren’t there though. Cleverly, Adobe have hidden some of the buttons within the panels. You can access these simply by depressing the Alt/Option button. In fact, the Alt/Option button is so frequently incorporated into both Lightroom and Photoshop that I find myself pressing it just to see what’s going to happen. The four places I find myself using the Alt/Option button the most is when working with filters, Resetting panels, Setting Black and White points and refining the sharpening of the image. When working with Filters, holding down the Alt/Option button switches the brush between brush and erase tools. This means you don’t have to select the erase tool from the panel, rather just hold down the Alt/Option button for erase and release for the usual brush. You can even adjust the feathering and size of the erase tool by keeping the Alt/Option button depressed and hitting the square brackets for resizing the brush or the Shift + Square brackets to resize the feathering of the brush. Probably the single largest criticism of Lightroom is that it is slow. It is not just slow, it can make a snail look like a greyhound at times. It’s slow to start up, slow to load, and inexorably slow when you attempt to use the Healing Tool or zoom in to see an image. Lightroom users get used to seeing the spinning beachball of death as they wait interminably for their images to render…or do anything. There is a quick fix that solves much hair-tearing slowness. Head to the upper menu bar and go to Lightroom>Preferences (or you can start using those shortcut keys and hit Cmd+, for Mac users or Cntrl+, for Windows users). Under the ‘File Handling’ tab towards the bottom you will find a cache size and purge cache button. For a start the default cache size of 3GB is way to small for the average catalogue. 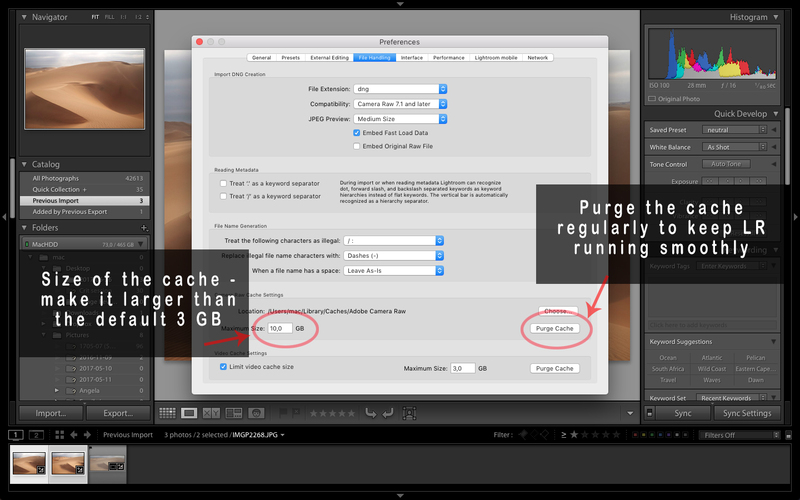 Purging this gives a significant performance boost to Lightroom, as does increasing the size of the actual cache (if you use Smart Previews or 1:1 previews you will definitely need to increase the cache as the catalogue file quickly grows beyond 10GB in size (bear in mind that this is still significantly smaller than the total data that Lightroom accesses). Creating a preset is very simple. Work on an image as you would usually do, going through the various settings that you apply to it. Once you have finished, click on the plus button on the top right of the Presets panel while in the Develop Mode. All the adjustments available are displayed with little tick boxes next to them. Decide which adjustments you want to create a preset with and ONLY tick those boxes. You can then give your preset a name and even add it to its own folder of presets. 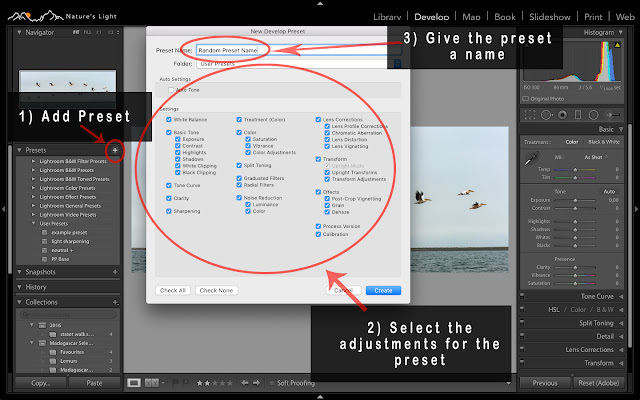 Open any image in the Lightroom Develop module and scroll down to the Camera Calibration Panel. click option next to ‘Profile’ and select ‘Camera Neutral’ (Canon users also have the option of Camera Faithful) - this then reverse engineers the image so that it looks closer to that on the back of the camera’s LCD screen if the picture style was set to ‘Neutral’. Select the add preset button on the preset panel on the left hand side of the Develop Module. Tick only the ‘Process Version’ and ‘Calibration’. Give the preset name a name like ‘Camera Neutral’ and click ‘Create’. Viola! you have sped up the workflow by automatically applying a preset on import. the example above is one such preset, but there could be any number, such as auto toning the image, adding lens correction presets and many more. Alright, so this is a contentious tip as some photographers shun this idea as taking up too much time. Ironically it can actually speed up your time though. 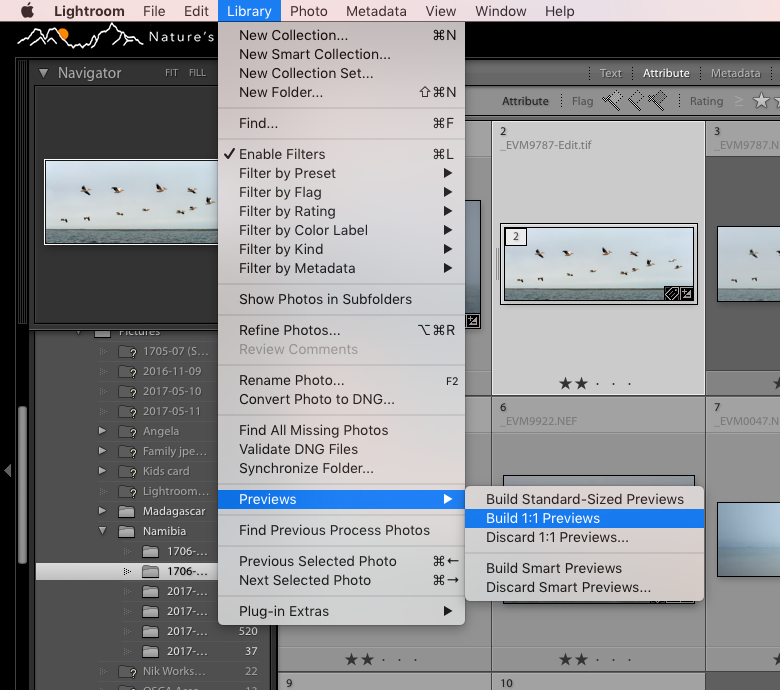 One of the options on import is for Lightroom to build 1:1 previews for all the images. This takes time though. Enough time that it slows the import by almost 4 times. The advantage of this is that you can then sift through the images quickly - even at 100% view - without having to wait for previews to load. This can dramatically speed up the time you take to weed through a day's images and cull the duds. If the thought of slow import times bothers you can also opt to import everything quickly and then use the menu to select which images to have 1:1 Previews built for: Library>Previews>Build 1:1 Previews (see below). Lightroom is an incredibly powerful, but streamlined editing application. I admit that it is still not my favorite in terms of absolute image quality. The amount of time it saves makes up for this though. Adding a few of these little tips and tricks to your Lightroom workflow can certainly improve your experience of this editing tool.